The Black Barn OpenAir Cinema has witnessed some memorable nights. In the 2009-10 season, Rocky Horror Picture Show screened. Half an hour in, a southerly hit and, instantly, the temperature dropped 10 degrees. Many of those who’d come dressed up, especially the men in fish-nets and suspender belts, had to leave. “They weren’t used to being that exposed to the elements,” laughs organiser Urs Blum. He and his wife Doris established the annual outdoor film season after seeing similar ideas in their home country, Switzerland. Now, celebrating its fifteenth birthday, the festival is a mainstay of Hawke’s Bay’s summer events calendar. Hunt for the Wilderpeople was another highlight. It played last year on a freezing night when rain threatened, yet packed out the amphitheatre’s capacity of 1100, attracting lots of families with visitors in tow, bundled into sleeping bags. This Way of Life was another big hit; made locally, it drew a huge crowd. Mostly, nights spent at Black Barn Cinema are balmy: The sun setting over vineyards, the vista stretching as far as Napier. It’s quintessentially Hawke’s Bay. Add in a glass of wine, an antipasto picnic, friends and family close by, it really is all the best bits of the Bay, bundled together in one glorious package. 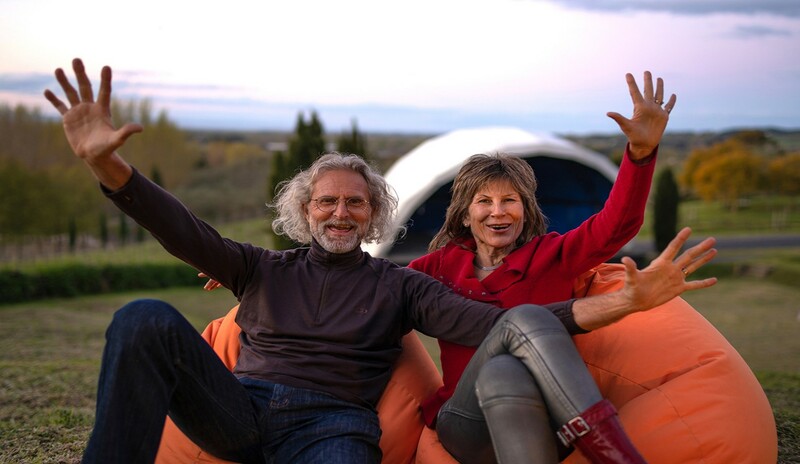 Urs and Doris, known to many for their yoga studio, seem to get a kick out of working on this project together. They share a vision for what they are creating for the community. It’s as much to do with the setting at Black Barn as it is about the movies. This coming season Black Barn Cinema will host another nine-night season. The film list includes: Mamma Mia 2, Three Billboards Outside Ebbing Missouri, The Guernsey Literary And Potato Peel Pie Society and Oceans 8. A new addition this year will be a People’s Choice Night where three potential films are floated, and the crowd picks their favourite via social media. Urs and Doris are careful to point out that it’s their loyal sponsors that are the real reason they can confidently commit to season after season of the outdoor cinema. “They are our safety net,” says Urs. NZME and Sommerset Partners have been with Black Barn Cinema for the full fifteen years. The new season starts on 27 December.